One of the amazing things about living in such a hi-tech age is the ability to improve the lives of others, including the world of dentistry. At South Shore Dental Care, we make it a priority to be aware with the modern technology to benefit our patients. Because of that, we offer CEREC same-day crowns, a machine that makes the idea of getting crowns a thing of the past. CEREC same-day crowns give our experienced doctors the ability to create a crown made specifically for you in a single appointment, beginning to end. 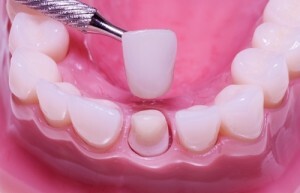 The course of action starts with routinely preparing your natural tooth for crown placement. A scanner then examines your natural tooth and the adjacent area, and that information is sent to a computer. After the computer analyzes the information, it presents a picture of the crown that will be initiated. The computer communicates with the milling machine in our office, the machine that makes your custom crown. Your CEREC crown is then chiseled from a solitary block of porcelain. The machine makes your crown in about 10-20 minutes, and uses porcelain that exactly matches your natural tooth color. Once your crown is finished, it is cemented onto your prepared tooth. After all is done, you’re left with nothing but a beautiful, flawless smile you can be proud of. One of the perks of CEREC one-day crowns is the fact the crown is metal and mercury free, giving you a natural look to your smile. Another benefit is that CEREC crowns offer a more durable security than traditional crowns, ideal for teeth toward the back of the mouth. There are no impressions that need to be made for CEREC crowns, erasing the mess and discomfort associated with impression making. Having over 25 years of analysis and elated patients, there is no doubt CEREC same-day crowns will change the way you look at crowns and cosmetic dentistry forever! by: South Shore Dental Care at May 12, 2014 .